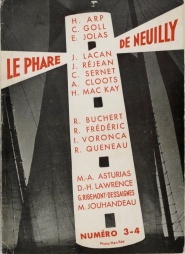 Le Phare de Neuilly is a surrealist magazine edited by the writer Lise Deharme and published in four numbers in Neuilly-sur-Seine in 1933. Contributors include Raymond Queneau, Man Ray, Miguel Asturias, Alejo Carpentier, Jean Supervielle, Marcel Jouhandeau, Jean Follain, Georges Vitrac, Robert Desnos, Jacques Lacan, Hans Arp, Brassaï, etc. Le Phare de Neuilly 1 (1933). 25 x 18 cm. Download (75 MB). Le Phare de Neuilly 2 (1933). 25 x 18 cm. Download (67 MB). 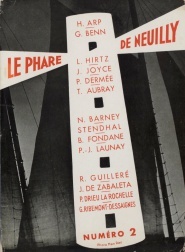 Le Phare de Neuilly 3-4 (1933). 25 x 18 cm. Download (113 MB). This page was last modified on 8 August 2014, at 23:50.